The first half of 2018 came with a variety of improvements for Weebly. It was a period of expansion and evolution, a celebration of reaching 40 million registrations, and more. After updating my Weebly review, I find some people asking whether the builder is now as good as, or even better than WordPress. What are the benefits and downsides of each platform? Before we delve into what makes the difference between these two content management systems, it’s important to note that we are comparing Weebly versus WordPress.org which is a downloadable software, not hosted web service WordPress.com. There’s a big difference between evaluating web building platforms for hobbyists and enterprises. The needs of these groups can be very different. My award of five stars for a super-scalable, open source CMS does not mean that people who enjoy drag-and-drop would also enjoy it. So, let’s put Weebly and WordPress head-to-head to see which one is better for your case. Weebly. Weebly (current version is called Weebly 4) is a hosted site builder with an in-browser editor that requires no coding skills at all. The only technical skill required is the ability to use a mouse. 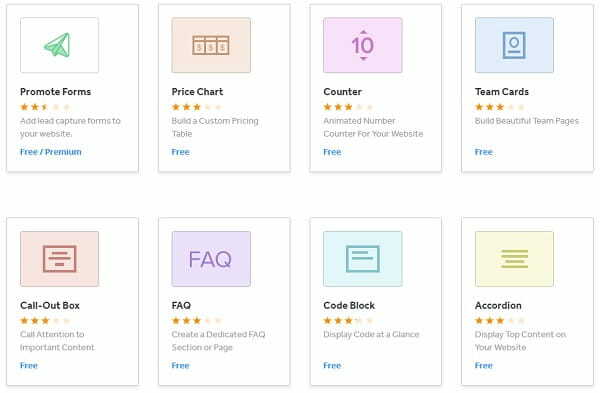 Clearly aimed at those of us who aren’t technical, Weebly offers everything you might need to build a website under the same roof: a drag-and-drop builder, a library of templates and included hosting. There’s nothing to download. The control panel is conveniently divided into two areas: Dashboard and Builder. The Dashboard lets you manage your site’s main settings, and the Builder offers a visual editor that supports drag-and-drop and inline editing. It provides a total WYSIWYG experience. Weebly offers free mobile apps for iPhone, iPad, Android and Apple Watch. These let you build, manage and edit your website from anywhere. WordPress. WordPress.org requires finding a webhost, installing the software and constant website maintenance. Though it’s fairly intuitive, there’s definitely a slight learning curve. Newbies will certainly need to familiarize themselves with the ecosystem of WordPress before they’re able to make any changes to the website design and/or functionality. Adding new plugins and switching themes can be a no-brainer, as many modern plugins work out-of-the-box and some themes support drag-and-drop, yet keeping all of your plugins working together can be difficult. Weebly vs WordPress. It should come as no surprise that Weebly is easier, as it was originally developed to meet the needs of users who have no idea about how websites are being created. WordPress is pretty enough intuitive, yet it still requires more deep knowledge of complex site management systems. Weebly. Weebly is chock-full of widgets and extensions that can be enabled with just a few clicks right from the Weebly control panel. There’s a decent blogging engine, an eCommerce solution, user membership support, various booking, forum and social media widgets. These are scalable to a certain extent. One of Weebly’s advantages is how quickly you can add this or that functionality. There are dozens of in-house extensions that you can integrate through the builder without having to leave your account and look for third-party plugins. Weebly is a versatile platform. Take a look at different kinds of websites created with Weebly: stores, portfolios and blogs examples. If you can’t find a ready widget for something, you can use Custom HTML element. It lets you add pretty much any embeddable content to your Weebly site. WordPress. WordPress is super flexible. However, almost any new feature requires a plugin (a tiny software package). The good news is that there are thousands of free plugins out there. The bad one is that they’re all developed by different providers who can simply stop updating their softwares one day. Besides, you can experience a severe plugin conflict. Also, too many plugins can make your website load slower. WordPress vs Weebly. Because most of the Weebly widgets are native applications, they work seamlessly and never conflict. WordPress works in a bit different way: it offers a better choice of extensions, yet you should be attentive to what you install. The major difference is that with Weebly you’re limited to only using building blocks it provides, while with WordPress you can scale your project as you wish. The technical nature of Weebly prevents many potential user errors. Weebly. Weebly has a collection of 55 ready themes that you can painleslly switch midway through the editing process. You can select the theme thematic you need: from personal website to online store. The latest Weebly themes are responsive from the start. 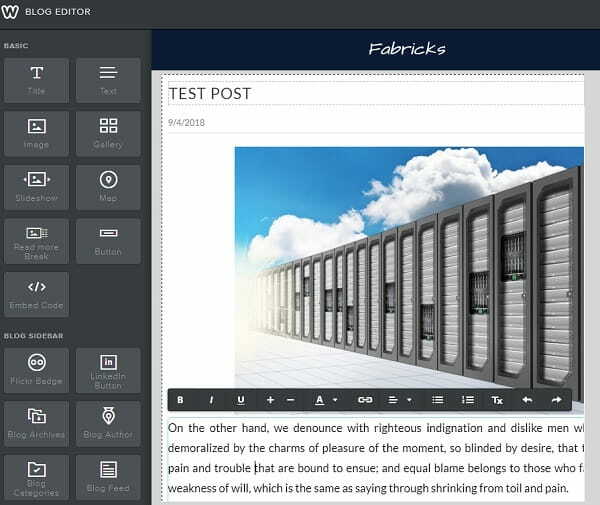 They’re comparatively easy to edit: newbies can opt for the standard drag-and-drop editor, while advanced users may want to try the advanced HTML/CSS editor. There are also third-party designers who create and sell custom templates for Weebly. You can easily apply them using ‘Import’ button. WordPress. There are thousands of free and premium themes for WordPress on the web. The biggest and the most official place to get a WP theme is the official library. In case you decide to try a free theme from any other place, be sure to check it for malware. 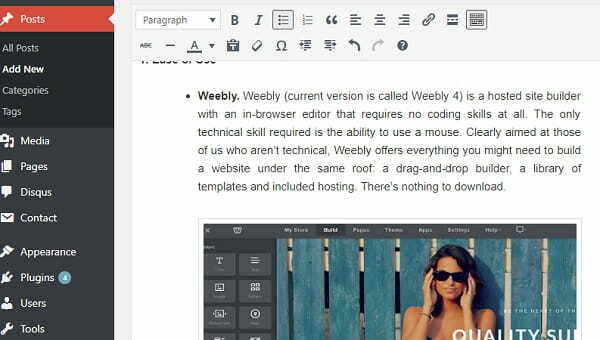 Though many new WP themes do offer some WYSIWYG editing, you’ll still have to do a lot of manual HTML and CSS editing. Weebly vs WordPress. On one hand, WordPress offers a greater choice. On the other hand, downloading, installing and editing a WP theme can be a tough task. Weebly, on the contrary, is extremely easy in terms of the design editing, but there are fewer templates. Weebly. Weebly has an extensive knowledge base, email support, free phone support and live chat. Also, there are many prompts in the control panel: a Site planner that helps you set your goals, and a To-do list that guides you through all the steps. WordPress. You’ll find many YouTube channels, forums and websites dedicated exclusively to WordPress. Other than that, there’s no phone or email to call for help. WordPress vs Weebly. Weebly has fewer users, which means they can serve them better. WordPress has no support staff, you can only rely on tutorials you find on the web. WordPress. The software itself is technically free, but you still have to pay for your hosting, domain name, theme (if premium) and plugins. The final sum will vary depending on the amount of premium plugins and themes you need to install, and on your hosting provider, too. Weebly vs WordPress. Weebly plans include free extensions, templates and hosting. The price, however, may increase when there is the need to install applications from the Weebly app center. WordPress is also free, while extra plugins, hosting and premium templates are paid. For an experienced webmaster who creates lots of websites, nothing compares to a self-hosted WordPress website. It’s flexible, comparatively intuitive. However, its awesomeness means nothing to a hobbyist who just wants to put up a simple website. In my opinion, with Weebly you can do a great portfolio, blog or small store website – I’ve seen dozens of successful websites created with Weebly. So, do you want to join Weebly community?